Fake pictures circulating on social media which users are falsely claiming depict inter-communal violence are inflaming already high tensions in Nigeria. It comes after three days of violence left more than 200 people dead in the centre of the country. A gruesome image of a woman face down in a pool of blood with a gaping shoulder wound is purported to be from the recent attacks. It has hundreds of retweets on Twitter, but it first appeared on the internet in 2011 in a story about domestic violence in Nigeria. Another image appears to show half a dozen people that were killed in the attacks. On closer inspection it becomes clear that the picture was not taken in Nigeria, and is actually the scene of a 2015 traffic accident in the Dominican Republic. They are both too graphic for us to display and were accompanied by highly inflammatory comments. And it's not just pictures. 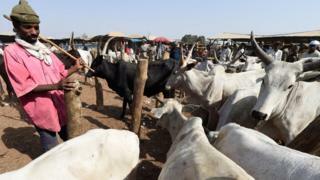 Earlier this week, major Nigerian news outlets ran a story claiming that Danladi Circoma, a leader of the Miyetti Allah Cattle Breeders Association, said the attacks in Plateau were revenge for the loss of 300 cows. "Since these cows were not found, no-one should expect peace in the areas," Mr Circoma is reported to have said. His comments drew widespread anger and swift condemnation, but he has denied ever making the statement. Misinformation and fake news in Nigeria is nothing new. In some cases, the lack of official information has created a vacuum which has been filled by rumours. This only serves to escalate tensions further. The explosion of social media - Nigeria has 26 million active Facebook users - and the rapid growth of smartphones means rumour spread quickly and easily on social media. In January, the presidency denounced a fake Twitter account which appeared to justify herdsmen attacks in Benue state to the anger of the public. A month later, a letter alerting the public to an apparent attack by herders on the Lagos-Ibadan Expressway, a major route in the country's south-west, went viral before the police issued a statement to deny it. As criticism of the government's handling of the crisis grows , there are fears that fake news could result in further violence. Last year, Information Minister Lai Mohammed spoke repeatedly about the danger of fake news, warning that it could "threaten and destroy" the country. Check the source: Fake social media accounts often try to appear as if they are from legitimate news sites, so check that every account you share information from is genuine. Verified accounts on Facebook, Twitter and Instagram have a blue tick. Look at multiple sources: Although this isn't foolproof, it's nonetheless worth checking multiple reputable new sources when trying to verify if what you're seeing is real. Ask yourself: Are trusted news outlets also reporting this information? Verification tools: There are dozens of tools online that can help determine the authenticity of a picture or a video. Google, Bing and Tin Eye all offer a reverse image search, which can tell you where images have been used before. Video verification is more tricky, but tools like InVid allow you to select video from Facebook and YouTube to see if or where these videos have been used before. Check metadata: If you have an original video or picture, you can check the metadata which will give you a wealth of information, including where and when the image or video was taken plus the device make and model. Unfortunately, when images and videos are uploaded to social media platforms their metadata is stripped out. Think before you post: It sounds obvious, but be careful not to add to the problem of fake news. Before you post, ask yourself if you're sure the information you're about to post is real.